Trekking boots require a snug fit around the heel area to prevent unwanted movement which can lead to excessive friction and blisters. HFS is a system of anatomically shaped high quality foam padding which helps to comfortably hold the heel securely whilst accommodating different heel shapes. CFS is a system to improve the flexibility of hiking boots around the ankle area in a fore/aft direction. CFS greatly enhances the ergonomics of the boot resulting in a more natural and comfortable walking action. Hiking boots with uppers made from stiff materials can restrict the natural articulation of the ankle joint causing discomfort when walking. CFS answers this problem by carefully positioning panels of soft pliable materials in specific areas of the upper. These soft compressible panels act like hinges to allow the natural articulation of the ankle in a fore/aft direction. Hard incompressible components such as lace eyelets are either made from soft textile materials instead or repositioned so as to not cause pressure points or impede articulation. CFS greatly enhancing the ergonomics of hiking boots is resulting in a more comfortable and natural walking action. 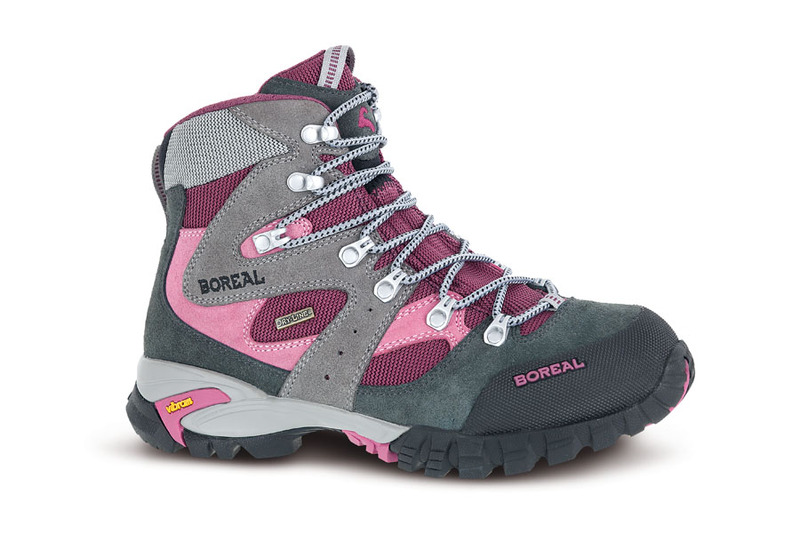 Whether your walks are short trips into the fells or longer backpacking adventures, the Boreal Siana is the ideal choice. Light, comfortable and durable and with a Dry-Line™ waterproof lining to keep you dry. Siana features a women’s specific last shape, ideally suited to the contours of a lower volume foot. The upper is constructed from high quality split leather and Teramida SL with a rubber toe cap for an excellent combination of durability and light weight. Our HFS™ (Heel Fit System) keeps your heel secure, while the CFS™ (a softer area at the rear of the ankle cuff and top of the tongue which allows unrestricted fore/aft leg movement) gives superb freedom of movement and comfort. Our Boreal Dry-Line™ waterproof and breathable lining keeps the foot dry and comfortable, and the PXF midsole provides ample support on rougher ground or when carrying a pack. The Vibram Nuasi™ outsole is grippy and durable, and features a shock-absorbing PU layer for underfoot comfort. Siana is ideally suited to 3 season fell walking, trekking and backpacking.